Trump often praises Fox News, but it is against him on this one. MEDIA GROUPS INCLUDING Fox News have joined CNN’s legal battle to restore the White House pass of a banned chief correspondent, as Donald Trump’s administration argued it had a broad right to allow or deny press access to the US president. Fox, which is controlled by Trump ally Rupert Murdoch and often draws praise from the president, said the revoking of Jim Acosta’s pass – after he locked horns repeatedly with the US leader – raises concerns over press freedom. “The President and White House possess the same broad discretion to regulate access to the White House for journalists (and other members of the public) that they possess to select which journalists receive interviews, or which journalists they acknowledge at press conferences,” said the brief filed ahead of the 3.30 pm (8.30pm Irish time) hearing in the case. The filing by US Justice Department lawyers argued that “the president could choose never to hold another press briefing again and cancel all press passes, without implicating due process protections”. 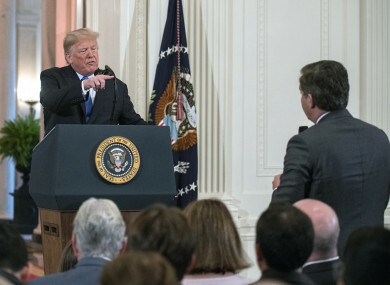 CNN — part of the WarnerMedia division of AT&T — has sued to restore the press pass of Acosta, its chief White House reporter who was barred after a testy exchange with Trump at a White House news conference. Email “Fox News backs CNN's legal action against the White House over journalist ban”. Feedback on “Fox News backs CNN's legal action against the White House over journalist ban”.